“Television is an invention that permits you to be entertained in your living room by people you wouldn’t have in your home.” I love watching television. I watch a lot of business channels, such as Bloomberg TV, which is my favourite and many others. I look forward to the day when AFRICA will have quality media, which gives us good entertainment, and insightful information into African business trends and those from other parts of the world as well. But yeah, welcome, this is my living room.” We were awed by the sight of this room! Sometimes, you have no words, you only watch, and take photos of course. That’s what we were here to do. 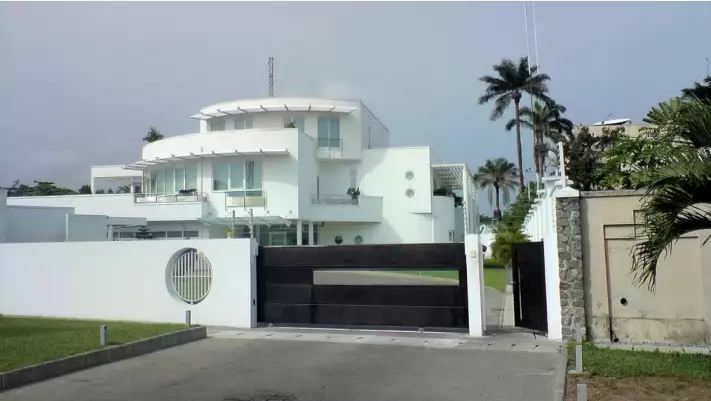 This is where Mr. Dangote hosts most of his meetings with business associates and government officials. This room has the boardroom style works well if the group is reasonably small and will spend most of the time talking to each other or listening to one or two speakers who are not using a screen. “They say that the kitchen is the heart of the home. It is where the meals are created – it fuels the bodies, minds and souls of friends and families all over the world. Some say that while life may be created in the bedroom, it is certainly lived in the kitchen, ” Aliko Dangote said. We had not expected the billionaire to be so philosophical, but to our surprise he was. It showed that how much thought and attention to detail he had put in the building of this house, to the extend that he has some deep thought about each and every one of its rooms. This is the place where most of the meals for the wealthiest African man are cooked for his nourishment. Walking in and walking out of Mr. Dangote’s massive house. If it was not for security you would not want to leave this beautiful place, with all its heavenly clues. Our photojournalists were given this very rare access. And this is where the wealthiest man in Africa sleeps. “I feel bed to show you where I sleep, you know,” he said, showing us into the bedroom. “But here is where I sleep. My wife and I try the best we can to keep this place as serene and quite as possible.” “To tell you the truth, I spend less time here than I do in my office and elsewhere where I can work. I do value relaxation and unwinding, and I have read a lot of news articles and research studies that recommend eight to ten hours of sleep.” “But why should one sleep so much? To relax? Don’t get me wrong, relaxing is good, but if you love to sleep, poverty will be your portion. Well, this is my bedroom, let’s move on.